If you live somewhere that already feels like summer, maybe you can just stop reading right now and go outside and enjoy a sunny patio somewhere. Maybe it already feels like springtime in your part of the world. How nice that must be for you. Over here in the Pacific Northwest, things are downright miserable. Rain, hail and chilly weather is how the first few days of May have been shaping up and I don’t like it one bit. On Sunday night, I went out for a Jane’s Walk in the torrential downpour and I froze. I actually needed freakin’ mittens. Mittens in May. May!!! Maybe it’s because we were so cavalier when February rolled around and it was warm and sunny, we didn’t even need to reach for mittens back then. Oh those bygone days! Instead of going on picnics or going out for leisurely bike rides, I’m turning on the heat and cozying up a little with some creamy pasta. This dish has bright green spring vegetables like asparagus and spinach along with a bite of lemon. It looks so bright that you can almost fool yourself into think that spring has arrived. Almost. But don’t be fooled. The flavours aren’t robust and exciting but don’t think that this is a bad thing – because it’s not. Everything from the pasta to the béchamel sauce to the vegetables works as a whole to help satisfy and comfort the weariest soul. This is a meal that tastes like something your mom would make and if your husband (or partner or roommate or friend) is anything like mine, they will go back for seconds and sing your praises. And this is always a nice thing to hear, especially when the rain is beating hard against your windows and you’re beginning to wonder if spring will really ever take hold in this dark little godforsaken part of the world. So take comfort in what you can and hope for the best. 1. Add 1 tablespoon of butter to a small saucepan and heat until melted over med-high heat. Add onion, garlic, salt & pepper, and chili flakes and saute until soft, about 5 minutes. Add in another tablespoon of butter and when it’s melted, whisk in the flour. Cook everything for about a minute and then slowly pour in the milk, whisking constantly. When the mixture thickens, add in the cheese and oregano, whisking again until smooth and creamy. 2. Meanwhile, cook pasta in salted boiling water. 3. Snap off asparagus tips and cut stalks into 2 inch bits or so. Rinse well. Drain and rinse spinach well, discarding any funky looking leaves. 4. Add the asparagus into a metal colander and dunk into the boiling pasta water and cover. Let cook for 2-3 minutes or until bright green and still crisp. Or steam your usual way, whatever. Set aside. 5. Just before draining pasta, dump in spinach and stir about until slightly wilted. 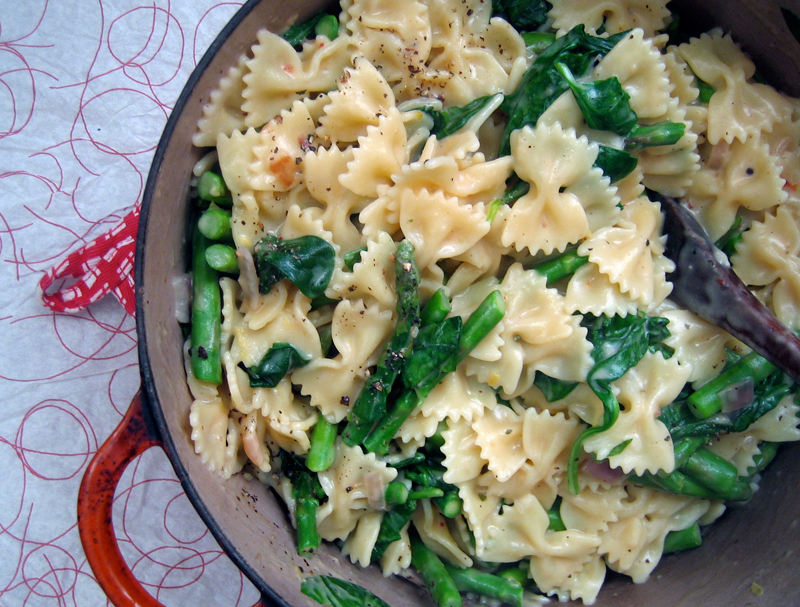 Drain pasta and spinach and add in asparagus. Pour in the béchamel sauce, lemon juice and lemon zest and toss until everything is coated. Taste & adjust seasoning if necessary. Serve in deep bowls. there is a type right towards the end i think. drain pasta and spinach, right? i am going to make this! The little touches are what makes all the difference; in your salad, adding the spinach at the end, the lemon flavor in the béchamel, make it from banal to delightful pasta salad. Crystal, yup you spotted it. Thanks for letting me know. Fixed. This looks springy & delicious indeed — and it’s actually pretty similar to yesterday’s dinner over here in New York City (going live on my blog in the morning: penne with peas, parsley and Parmesan)! Great minds — or great bellies? You would have totally fooled me into thinking the PNW was awash in sunshine, butterflies and crisp white wine already. Here’s hoping it warms & brightens up for all y’all soon! Bowtie pasta is one of my favourite shapes and also the “little ears” pasta too! Yum, I can never get enough of bechamel sauce! the pasta dish though – it’s nice. with food like that you just don’t care what month it is. that’s what bechamel does to ya! Thanks for not letting me be the only person who pulls out their mittens in May, I just did yesterday! Man I hope it warms up soon… I think I say that every year. 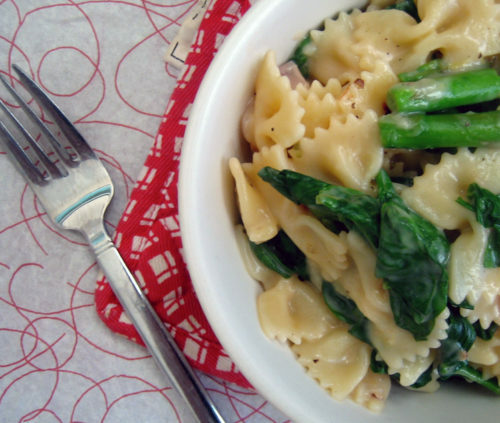 This pasta sounds super comforting and cozy, what a great way to use asparagus and spinach together. Yeah, I turned on our gas fireplace today. I should have just made a whole big pot of yum, like this pasta. I love the mix of rich and fresh here. Perfect combo. I’m sorry chica. Spring (or summer…whichever comes first) will be there soon! In the meantime, eat cream sauce. I like the way you think. Wow. This looks lovely, healthful, and delicious! I would love to make this! I make a very similar version to this, and it’s completely satisfying!! Thanks for sharing the recipe!! 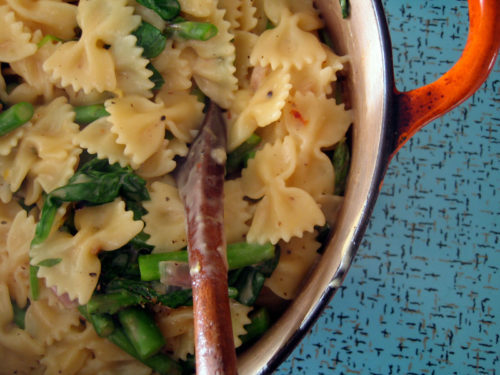 Wow this pasta looks awesome – I’m over in California and even though it’s beautiful and sunny some lovely pasta with asparagus sounds delicious! That looks great… I love the fact that you have included some greens to make it more nutritious. I bet peas would be good in this as well. And yeah, what is with this frigid May? I am intrigued that you wnet on a Janes walk…I try to go on the John Atkin one every year and never get in – they fill up so fast. Which one did you do? This suits my mood and my fridge, thanks for the recipe. Here in the Valley (fancy speak for Chilliwack) I’m dreaming of spring as well.. I’m tired of the daily wet post-puddle pant changing (my toddler’s not mine, usually). YUM! This totally IS Spring to me. I’ve made something similar, but I love the addition of super sharp cheese. Nervous, I’m totally going to head over & check out your recipe. I’m also fond of bowties, Bijoux. I know, call me jealous. Jacqui, I’m just sighing right now. Thanks Dana, it’s a good combo and I really hope this weather warms up soon. Fireplaces & mittens aren’t a good start. Thanks Joanne. I sure hope so too! Jackie, thanks, I think so as well. Wow Tracy, glad like minds think alike. Amie, I think this could be enjoyed all seasons really, but it’s definitely nice when there’s a chill in the spring air. Peas would be awesome in here, Hag! I went on the John Atkin walk about Chinatown opium dens, laundries and pawn shops. It was amazing. He will have summer walks every Wednesday! Haley, my pants got soaked in the rain so I know what you speak of. We can keep positive thoughts, right? Sues, I think the super sharp cheese rescues this dish from bland. Sounds delicious, even if you are enjoying spring weather. Anytime is the right time for asparagus and creamy sauces. I’ve been so jealous of all the asparagus I’ve seen on blogs recently that I had to pick some up today! This pasta sounds really good. I love that there’s just a small amount of cheese. This looks great. The sun finally came out in Portland today. Hope it comes your way soon. Luv this recipe…although it is warm in Texas already, spring veggies are still coming in from the garden for now! Who doesn’t love a big bite of freshness for dinner??? rachel, thanks so much for enjoying the meal and I’m so glad to have a new fan 🙂 Yay! Thanks Liz! I agree, but I do wish spring would settle in here for a little while. Ashley, I didn’t want this to be a mac & cheese kind of meal. Just a little different with only a bit of cheese. It works really well. Georgie, 24 degrees sounds lovely! Yes, this recipe is very interchangeable, so glad that you made it work with the veg you had on hand. Walterknitty, the sun is here, finally! Today looks like another beautiful day too. I just want the temperature to creep up a bit more. Greedy? Yes! Looks delicious! Seems like a good weeknight option! totally delicious!! I made this tonight and it was so good. the lemon was the perfect additional flavor to make the cream sauce interesting. I added more cheese than the recipe called for, probably around 3/4 cup shredded (because I always add more cheese) and it was like mac n cheese for grownups! Amanda, it’s perfect for a busy weeknight. Bekkah, so glad you enjoyed it! i’m really excited to try this, thanks! i have an amateur question though, can i use frozen spinach? Juliana, yes go ahead and use frozen spinach….just thaw and squeeze out any moisture. Mining the ELS archive, I found and made this gem. Not too much cheese, lots of healthy veggies, and the lemon adds an unexpected zip. A well designed and tasty recipe from the pleated one.